On a recent episode of creepy American TV show 'Killer women Piers Morgan received a shocking confession. In July 2003, then 20 year old killer Ashley Humphrey stalked and followed a stranger Sandra Rozzo home, and shot her eight times at point blank range, killing her in cold blood. After her arrest and subsequent trial, Humphrey took a plea bargain and blamed the horrific murder on her own abusive husband. Currently, her husband Timothy “Tracey” Humphrey is serving life in prison for the Florida crime, whilst his killer wife Ashley is serving a 25 year stretch for carrying out the execution . Many would agree that it's a shockingly light sentence for someone who actually pulled the trigger and did the killing. But having served more than half her sentence already, Ashley surprisingly confessed the truth about what really happened, for the first time on TV. Yes you may have guessed it—she was responsible for the plan—not her husband. She admitted this to Piers on Killer Women that she was the one who first came up with the idea to kill Rozzo. A completely different testimony from the one she gave in court during the murder trial. And what caused this young woman to come up with such a henious idea? Well Sandra who was an ex-girlfriend of Timothy her husband, was due to testify against him in court on charges of battery and sexual assault, which occurred while they were dating, so to shut her up, they decided to murder her. Ashley told the ITV programme: “I suggested what if she were not to show up in court. "That is where it started and it snowballed. I was the first to say it. 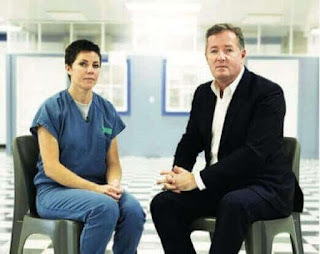 Piers later said he didn't know the full gravity of her confession until he spoke to one of the detectives who worked on the case at the time. Gasping in shock, the officer said that if she had given this same testimony in court back then, she definitely would have gotten the death penalty.